Summary: He is the deadliest American sniper ever, called “the devil” by the enemies he hunted and “the legend” by his Navy SEAL brothers . . . When I started reading Chris Kyle’s AMERICAN SNIPER, the first thing that came to mind was LONE SURVIVOR by Marcus Luttrell which I reviewed last year. Chris Kyle and Luttrell were Navy SEALs, each lived in Texas and aspired to a military career at a very early age, each fought in the War on Terror, each lost close comrades in battle and each described the bravery of our military. Both stories are about heroism, patriotism and self-sacrifice. Chris Kyle begins his autobiography by briefly describing his pre-military life and then moving on to his experiences in becoming a Navy SEAL and the horrors of Hell Week. It was amusing and ironic to learn that Kyle hated the water. Kyle then goes on to tell the reader about his training to become a sniper and his four deployments to Iraq over a ten year period. KYLE talks about his numerous sniper kills but does not try to glorify them. An interesting aspect of his sniper career is that he worked with other branches of the U.S. military such as the Army and Marines. It was also interesting to learn that U.S. snipers work without spotters and all “kills” must be witnessed. The stories Kyle tells give the reader a view of war that is not told by the media. The stories relate to the sacrifices and demands our military men and women make to protect our country. The stories that describe the deaths of two of his closest friends and of his being wounded twice are accounts that will capture the hearts of any reader. The veil of invincibility that Kyle portrays throughout the book was certainly challenged by these events. An interesting element of the book is the brief personal accounts of Kyle’s wife, Taya, describing the strain of war on their marriage and children. These are spread throughout the book as a contrast to some of Kyle’s military stories. Both Chris and Taya openly discuss the difficult adjustments that arose during home leaves and after retirement from the military. Kyle also spends some time talking about the hazing, hell raising and bar fights that seem to be a not-so-glamorous right of passage for Navy SEALs. The “rough” language used throughout the book may leave some readers uncomfortable. 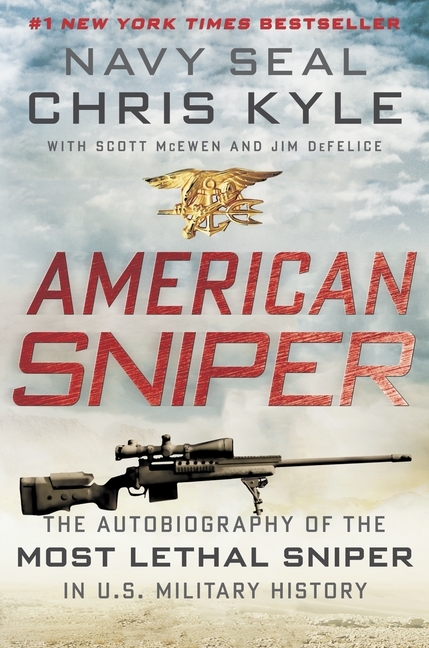 AMERICAN SNIPER is not the best written story but is Chris Kyle’s deeply personal account of his experiences as the most prolific sniper in U.S. military history. This is what makes AMERICAN SNIPER a worthwhile read. Thanks to the publisher for providing a review copy of this book and for Booking Pap Pap for his insightful review. This actually sounds appealing to me. I can't imagine what those men go through. This does sound worthwhile. Thanks to BPP!